Jacqueline Wilson’s latest girl heroine in a contemporary fix is 11-year-old Lily, big half-sister to six-year-old twins, Baxter and Bliss, and three-year-old Pixie. When their attractive, but feckless mother jets off to Spain on holiday with the latest in a long line of unsuitable men, Lily is left home alone to look after her siblings. An interminable week of surrogate mothering stretches ahead of her. 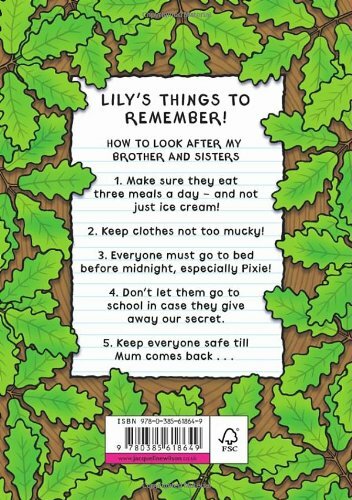 Can Lily keep the family fed and entertained until her mother gets back, without any interfering adults finding out? Wilson’s plot pushes gently at the bounds of credulity: I reluctantly had to ask myself whether four children really would be able to live cheek by jowl in a tree trunk in the park for three days without being discovered. Neither is there is any great sense of peril from the outside world until the latter stages of the book when the hanging ending leaves us in doubt as to whether the family has a future together. However in Lily, Wilson has created yet another winning lead character. Lily’s determined attempts at being one of ‘those pretty cosy mums you see in the telly adverts’ are genuinely affecting. Most memorable of all are the scenes in the book where she mines all her powers of invention to entertain her younger siblings: using washing-up liquid as bubble bath, playing at being princes and princesses, and thinking up weird and wonderful names for the deer in the park. Unlikely as it occasionally might seem, Lily Alone is also unlikely to disappoint Wilson’s legions of fans.